WASHINGTON—Participants in a suicide prevention walk in Washington, D.C., on June 1-2 carried the memory of their loved ones on their backs, literally. With their names etched on the back of their blue walk t-shirts, suicide loss survivors walked 16.4 miles through the night from 7 p.m. to 5 a.m. in remembrance of their loved ones and to raise money for suicide prevention. The nation’s capital was the location for the “2013 Out of the Darkness Overnight Walk Washington, DC,” which was sponsored by the American Foundation for Suicide Prevention (AFSP). This overnight walk is a journey through the night, beginning at dusk and ending at the dawn’s early light. 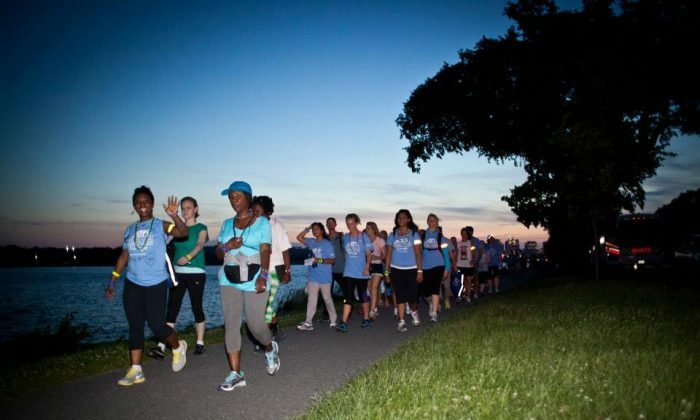 The AFSP says on its website that the aim is to “break the silence and bring the issues of depression and suicide into the light.” Washington, D.C. is the only city this year in the nation to hold the overnight walk. AFSP is also sponsoring shorter, daytime walks. Out of the Darkness Community Walks are 3-5 miles walks, and take place during the day and are organized locally all over the country in the fall. There are more than 250 Community Walks, said Public Relations Manager Wylie G. Tene. “Not a day goes by that I don’t wonder where he might be or what he might be doing,” said Rose Mary Fuss, an Overnight Walk participant, who was remembering her son, Tommy. Tommy, 17, committed suicide two months after being diagnosed with depression. Fuss was one of the many who walked to remember a friend, a companion, or a family member that took his or her life. Some walkers walked for themselves as survivors of their own suicide attempts. In a video on the walk website, participants described the walk as not just a fundraiser, but as a healing experience, one that made them feel that they were not alone in their depression. “You feel like you are hugged throughout the night,” said Marie Beth Stewart, 57, a walk participant and resident of Vienna, Va. Stewart said that she lives with depression and encourages people to take action to get treatment for their mental illness. Dennis Tackett, a member of the AFSP National Capital Area chapter, raised $16,103, exceeding his goal of $15,000. Tackett and his wife walked in memory of their son Jeff, who committed suicide in 2005. Jeff was 26. Collectively, the nearly 2,000 walk participants raised $2.6 million before expenses to benefit ASFP’s suicide prevention research, education, and advocacy work. “Many of the participants are from the greater D.C. area, but there are people that came from all over the country to walk for this,” said Robert Gabbia, executive director of ASFP. Gabbia attributes part of the record level of participation and funds raised this year to the walk’s location in the nation’s capital and the participants’ desire to raise the awareness of lawmakers. “We advocate for more suicide research by our federal agencies. It’s the 10th leading cause of death, but it doesn’t get enough funding,” Gabbia said. According to the Center for Disease Control and Prevention (CDC), suicide rates steadily increased from 2000 to 2010, with 38,364 suicides reported in 2010. That same year, the highest rate of suicide was among people between ages of 45 to 64. Of those that committed suicide, an estimated 79 percent were male and 21 percent were female. The CDC reports that in a 2011 nationally-representative sample of youth in grades 9-12, 15.8 percent of students reported that they had seriously considered attempting suicide during the previous 12 months. Police are currently investigating what appears to have been a suicide on Boston Red Sox owner John Henry’s yacht, “Iroquois,” it was reported.